New York, NY – Now celebrating its 35th year, the annual Museum Mile Festival (http://www.museummilefestival.org/) takes place rain or shine on Tuesday, June 11, 2013, from 6:00 pm to 9:00 pm. Over 1.5 million people have taken part in this annual celebration since its inception. Festival attendees can walk the Mile between 82nd Street and 105th Street while visiting nine of New York City’s finest cultural institutions, which are open free to the public throughout the evening. Visitors can also walk to 110th Street where they will be greeted by music and outdoor art activities at the site of Museum Mile’s newest museum, the Museum for African Art. Several other participating museums will also offer outdoor art activities for children. 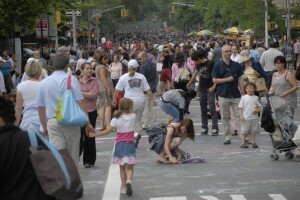 The Museum Mile Festival’s opening ceremony takes place at 5:45 pm at The Jewish Museum (Fifth Avenue at 92nd Street). Traditionally, the Commissioner of Cultural Affairs and other city and state dignitaries open the Festival. El Museo del Barrio; The Museum of the City of New York; The Jewish Museum; the Smithsonian’s Cooper-Hewitt, National Design Museum; National Academy Museum & School; Solomon R. Guggenheim Museum; Neue Galerie New York; New York/German Cultural Center; and The Metropolitan Museum of Art are the nine institutions participating in this highly successful collaboration. (The Goethe-Institut New York has moved to an interim location.) The Museum for African Art has joined the Museum Mile Festival as its newest member. 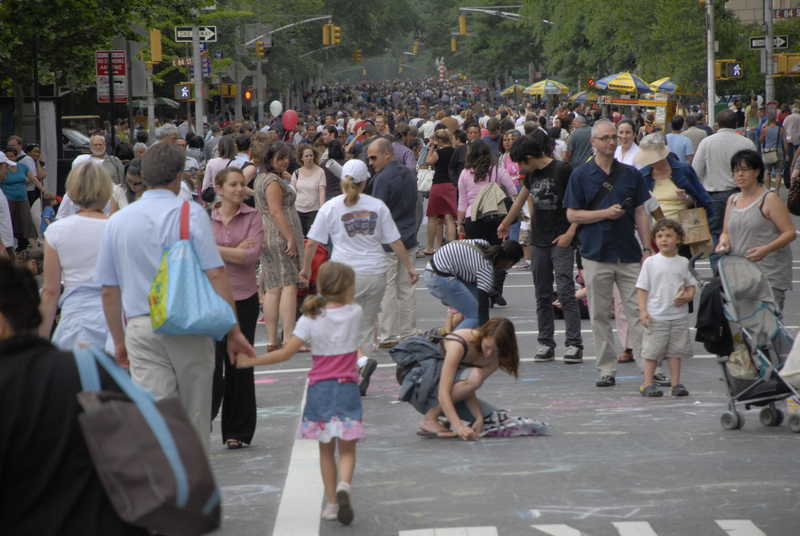 Fifth Avenue is closed to traffic and becomes a strollers’ haven. Special exhibitions and works from permanent collections are on view inside the museums’ galleries and live music from jazz to Broadway tunes to string quartets is featured in front of several of the museums. Additional street entertainers perform along Fifth Avenue all evening. Festival attendees will be among the first to see El Museo’s Bienal 2013: HERE IS WHERE WE JUMP, the seventh edition of El Museo del Barrio’s biennial exhibition showcasing the most cutting-edge art produced by emerging Latino, Latin American, and Caribbean artists living and working in New York, opening that evening. Other exhibitions on view include: Making Room: New Models for Housing New Yorkers, which explores New York City’s changing, and sometimes surprising, demographics, and will feature a full-sized, flexibly furnished micro-studio apartment of just 325 square feet – a size prohibited in most areas of the city, at The Museum of the City of New York; Jack Goldstein x 10,000, the first American retrospective of the influential Canadian-born artist Jack Goldstein, a central figure in the Pictures Generation of the 1970s and 80s, at The Jewish Museum; Jeffrey Gibson: Said the Pigeon to the Squirrel at the National Academy Museum & School, exploring notions of identity and modernism within a contemporary context; A Long-Awaited Tribute: Frank Lloyd Wright’s Usonian House and Pavilion, which pays homage to the work of the renowned architect, at the Solomon R. Guggenheim Museum; the Neue Galerie’s monographic exhibition Koloman Moser: Designing Modern Vienna 1897-1907, devoted to the Austrian artist, designer, and co-founder of Wiener Werksättte, surveying the entirety of Moser’s career and including important interior design commissions, examples of graphic design, furniture, textiles, jewelry, metalwork, glass, and earthenware; and PUNK: Chaos to Couture at the Metropolitan Museum will examine punk’s impact on high fashion from the movement’s birth in the early 1970s through its continuing influence today. Established in 1978 to increase public awareness of its member institutions and promote public support of the arts, the Museum Mile Festival serves as a model for similar events across the country. For further information, the public may call 212-606-2296 or visit the festival Web site at MuseumMileFestival.org. The Museum for African Art will provide hands-on educational activities for families and children on the Museum’s plaza. El Museo del Barrio: El Museo’s Bienal 2013: HERE IS WHERE WE JUMP, and Presencia, the most recent exhibition of work from El Museo’s permanent collection. Cooper-Hewitt, National Design Museum: The exhibition galleries and Arthur Ross Terrace and Garden will be closed due to Cooper-Hewitt’s RE:DESIGN, the most ambitious renovation project in the Museum’s history which will provide enlarged and enhanced facilities for exhibitions, collections display, education programming and the National Design Library, and an increased endowment. During the renovation, Cooper-Hewitt’s usual schedule of exhibitions, education programs and events will be staged at various off-site locations including the Cooper-Hewitt Design Center in Harlem. Visit cooperhewitt.org for additional information. The Goethe-Institut New York is still at its interim location at 72 Spring Street, 11th Floor. Nevertheless, for the Museum Mile Festival the Goethe-Institut will be present at its former building on 1014 Fifth Avenue, providing information about its new venues, programs, activities, and library.